Although George W. Bush famously said that he wanted Osama bin Laden â€œdead or alive,â€� he made clear that he was not serious about this. Besides stating that he was not concerned about bin Laden, he demonstrated this by diverting most of Americaâ€™s military resources to Iraq. Bush could, of course, be unconcerned about bin Laden because he knew that, besides the fact that bin Laden had nothing to do with 9/11, he was probably dead anyway. I do not know what President Obama and his people think about these matters, but their rhetoric presupposes that bin Laden was responsible for 9/11 and is still alive. One way to argue against this war is to point out that, if these intelligence experts do not even know whether bin Laden is alive, they certainly cannot know where he is and what he is thinking. There are, to be sure, other good arguments against the this war, and many critics are making these arguments. But to point out that bin Laden is almost certainly dead provides an argument that goes to the heart of the publically articulated rationale for this war. Of course, another way to argue against this war would be to point out that bin Laden had nothing to do with 9/11. But even though our own FBI has admitted that it â€œhas no hard evidence connecting Bin Laden to 9/11,â€� a large part of the American population has been conditioned to reject all revisionism about 9/11 out of hand. As we saw recently with â€œthe Van Jones affair,â€� people are considered unfit for public service if they once signed a document suggesting that the official account of 9/11 might not be fully true. My little bin Laden book is primarily for people who, besides assuming that Osama bin Laden was responsible for the 9/11 attacks, also believe that the AfPak war is justifiable because we need to prevent him from planning another attack. Many such people will turn against the war if they become aware of convincing evidence that bin Laden is almost certainly dead. There is considerable evidence for this conclusion. This evidence is of two types: objective evidence and testimonies. Third, bin Laden had kidney disease. He had been treated for it in the American Hospital in Dubai in July 2001, at which time he reportedly ordered two dialysis machines to take home. If you have ever wondered what bin Laden was doing the night before the 9/11 attacks, CBS News reported that he was being given kidney dialysis treatment in a hospital in Pakistan. And in January of 2001, Dr. Sanjay Gupta said â€“ based on a video of bin Laden that had been made in either late November or early December of 2001 â€“ that he appeared to be in the last stages of kidney failure. This is an excellent article, with only one serious flaw. In 2007, Benazir Bhutto, being interviewed by David Frost, referred to Omar Sheikh as â€œthe man who murdered Osama bin Laden.â€� Codevilla cited this statement as further evidence that bin Laden is dead. But Bhutto had simply misspoken: She had meant to say â€œthe man who murdered Daniel Pearl,â€� which is the standard way of referring to Omar Sheikh. That she misspoke was shown the next day, when she told CNN: â€œI donâ€™t think General Musharaf personally knows where Osama bin Laden is.â€� Ten days later, speaking to NPR, she reported having asked a policeman assigned to guard her house: â€œShouldnâ€™t you be looking for Osama bin Laden?â€� This flaw aside, Codevillaâ€™s article provides good support for his claim that the widespread belief in bin Ladenâ€™s continued existence is not backed up by evidence. What about the â€œMessages from Osama bin Ladenâ€�? Many people, of course, assume that there is a lot of evidence that bin Laden is still alive, namely, the dozens of audio tape and video tape â€œmessages from bin Ladenâ€� that have appeared since 2001. These tapes provide good evidence, however, only if they are authentic. The longest chapter of my book is devoted to this question. I show, in the first place, that the technology for making fake audio and video tapes is now so advanced that even experts can be fooled. So although the press regularly tells us that intelligence agencies have authenticated the latest bin Laden tape, it is virtually impossible to prove a tape to be authentic. Hello, long time no see. It is me, Osama bin Laden. And no, this not to be confused with just-for-men hair color commercial. . . . I make this video to prove to world that me still alive and kicking. This video is very funny. But there is, of course, nothing funny about the fact that obviously fake bin Laden videos have been used, and are still being used, to justify the AfPak war, which continues to kill dozens if not hundreds of innocent people each week, including women and children attending weddings and funerals. If my little book, by showing that bin Laden has probably long been dead, can help shorten this war, it will have served its main purpose. Its other main point, to which a separate chapter is devoted, is that these fake bin Laden tapes appear to be simply one part of an extensive propaganda operation, in which the US military intelligence is using tax dollars â€“ illegally â€“ to propagandize the American public, with the aim of furthering the militarization of America and its foreign policy. I hope my little book will stimulate the 9/11 truth movement, along with the anti-war movement in general, to take on more fully the task of exposing this propaganda effort, to which a growing portion of our tax dollars is being devoted. 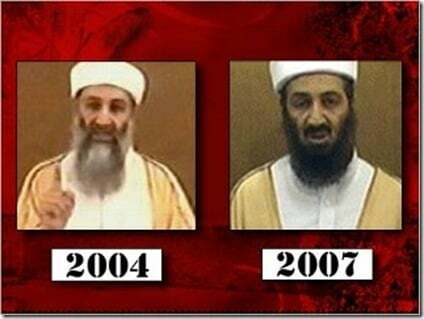 Re: Osama Bin Laden: Dead or Alive ? I heard the image on the right (with no grey hair) is CG. Really, knowing that the Bushes are just his bum buddies anyway, what difference does it make. I can't raise an "I care" on this sorry.